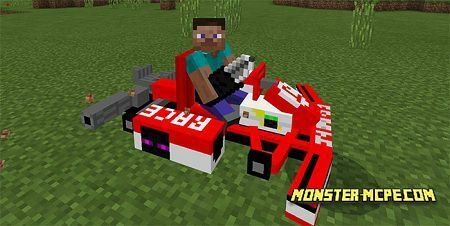 This new addon gives opportunity to drive a new racing car — kart. Player can choose this vehicle in six different colors. There are some problems with rotation but in general, it is very qualitatively developed model of kart. 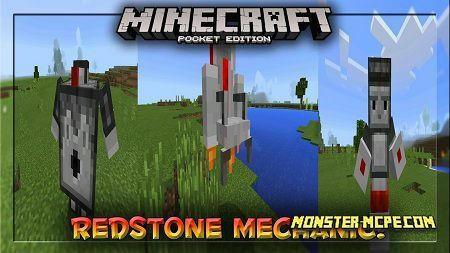 It is really great mod if you looking for racing vehicle in MCPE world. Player can find it in most of the biomes, because it replaces rabbit. Also, you can use a spawn egg of rabbit in your world to spawn it. All you need for first time is to get used to control this vehicle. — Windows 10: right click on shadow of your vehicle and click on ride. — iOS or android: the same instruction as for windows but except simple right click you should long press on shadow. 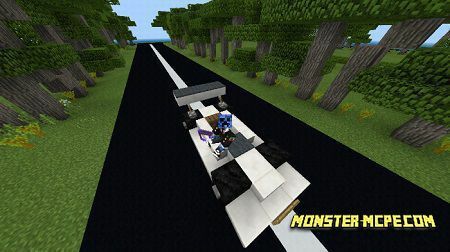 Well known key in MCPE world as carrot, you should use for driving your vehicle once you seat in kart for start drive. As it was mentioned before, kart exist in six different colors, that is why you can choose you like.